It is entirely possible that I do way too much thinking. In fact there are few things I enjoy as much as a beer, a book and a ponder - preferably all at the same time and in a good pub. 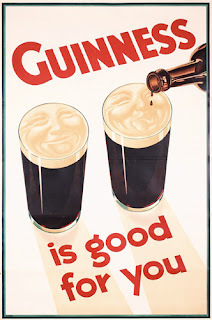 One thought that recently trundled its way through my brain was just how beer advertising has changed over time, and how advertising standards may have impacted beer production in the years before craft brewing took off, especially over on this side of the Atlantic. So most American beer labels are devoid of interesting information for the consumer, such as how calorific the beer is - just a quick point, the average beer is lower in calories than a 55g (2oz) bag of crisps (chips for my American friends), oh and beer has no fat, no cholesterol, and on average about 1/6 of the sodium in said bag of fried potatoes. Then there are the raft of B vitamins, the hops add antioxidants and a natural antibiotic to the mix and the interesting fact that Germany and the Czech Republic have lower than average heart disease rates, and higher than average beer consumption - linked perhaps? Given that American brewers are banned from making health claims for their drinks, in spite of the scientific evidence to the contrary for moderate beer drinking, is it any wonder then that beer in this country became the pale, flavourless and cold tipple exemplified by Millers, Budweiser and Coors? You can't claim your brew is nutritious, but you can claim it is refreshing - so beer becomes more about refreshment than flavour, with the decrease in hops and malt I guess the nutritious element of beer went out the window. For centuries before the insanity of Prohibition, beer was considered a staple part of the diet, admittedly because the water was usually full of junk, but it was always about more than simple refreshment. being cynical, you really have to wonder how the human race evolved with Surgeons General telling us how to live? Beer is part of a healthy lifestyle, whether we are talking physical or social - I always wonder about people who claim to love beer but never go to the pub, but that is a separate issue. So yes, in many ways the old Guinness adverts were right, beer is good for you. Obviously the Machair and Gunnersbury were easy to place into categories, the Red Coat though posed something of a problem. As I have written about before, Red Coat was brewed to prove a point. Said point being that the Black IPA/CDA/India Black Ale fad that is sweeping the nation is, in fact, nothing more than over hopped porter, and of course using hops like Simcoe and Cascade. Thus I took the recipe for a clone of Widmers Pitch Black IPA as published in Brew Your Own magazine, cut it down to the size of a single gallon (being cheap and not wanting to waste time and effort on something I thought would taste like crap) and replaced the original hops with British equivalents. Out went the Warrior and Cascade, in came Admiral and East Kent Goldings at the right amounts to achieve 65IBUs. Everything else though was left the same, including the use of a clean American ale yeast. 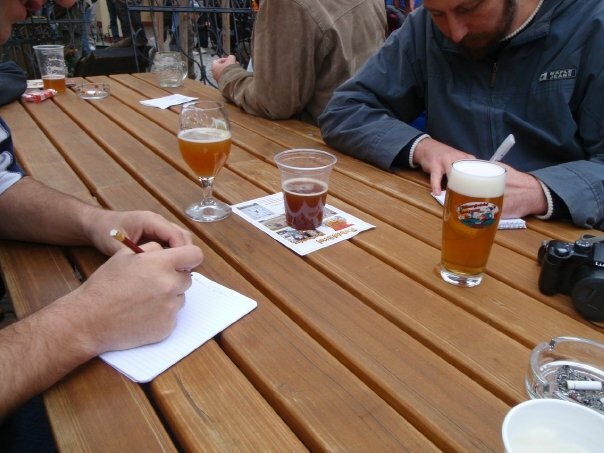 In the original article, homebrewers were encouraged to enter their Black IPA beers in Category 23 of BJCP competitions, the catch all for anything that hasn't already been micro-managed to within an inch of its life, and to enter Black IPA/CDA/IBA as the "base beer" required in that category. My original plan had been to enter Red Coat in that category, claiming the base beer to be "British Style Black IPA" or something equally meaningless. Eventually though I decided to enter it in the Robust Porter category, after all that is what I am convinced it really is. Red Coat Exporter took gold in the Porter category. As far as I am concerned, my little project has proven that Black IPA as an innovation is twaddle, and Ron's posting about Barclay Perkins' hopping rates in EIP confirmed my suspicions. In reality then, the originators of the "style" were doing nothing more than reviving an old British style of beer and giving it an American twist in the form of the hopping schedule. Nothing revolutionary, innovative or even wondrous about that - after all that is what happened with IPA (perhaps Pete Brown will do a a follow up to Hops and Glory but this time with an Export India Porter?!). Can we please dispense with the hysteria about this "innovation" and just accept the historical facts and give this style its proper name in the competitions and guides so beloved of stylistas, even if "American Style" has to be appended to the name? I brewed Export India Porter, Widmers brew an American Export India Porter, simple really isn't it? Maybe one of the British brewers will jump on the bandwagon and make an Export India Porter using British hops, Thornbridge? Lovibonds? Everards? Fullers even? What about BrewDog doing one for the homeland? My next task is to scale this recipe up to my normal size brews and brew some more to satisfy the wave of people who have asked me in the last 24 hours for a bottle, and of course for entering in further competitions - I don't think my one remaining bottle will go very far really! On a side note, Machair took silver in the Mild and Brown Ale category, coming second to the eventually winner of Best of Show. The picture is Machair Mild, as I haven't got round to taking pictures of Red Coat yet! Back in November 2008 I met with Barry and the Beer Nut at the Bull and Castle in Dublin. I came bearing three bottles of Primator's Exklusiv strong lager, which had recently been named the best lager in the world. The third bottle was for Thomas Prior, who unfortunately couldn't make it. Nearly two years on and Thom is carving out a career in brewing for himself, and so it is a return to Ireland for today's Brewer of the Week. I suppose it started with home brewing and a desire to further develop and use the skills I had learned over the years. I started the process by studying brewing science via distance learning at Heriot Watt university. My primary degree is in biochemistry and large parts of a well rounded science degree are applicable to brewing. To be honest I could have happily buried my head in books for quite a while without realising the more practical aspects, but the combination of my egg head studies with the more business savvy minds of Stephen and Paul at Trouble resulted in a business model that shows great promise. As perhaps all micro brewers know too well, financial and business considerations are every bit as important as crafting the best beer you can. An unswerving attention to detail coupled with a true desire to brew beer that tastes great. It's hard to say which comes first because you can't have great beer without paying close attention to the process. Before being a professional brewer, did you home brew? If so, how many of your home brew recipes have you converted to full scale production? I home-brewed for a number of years before taking the plunge into professional brewing. 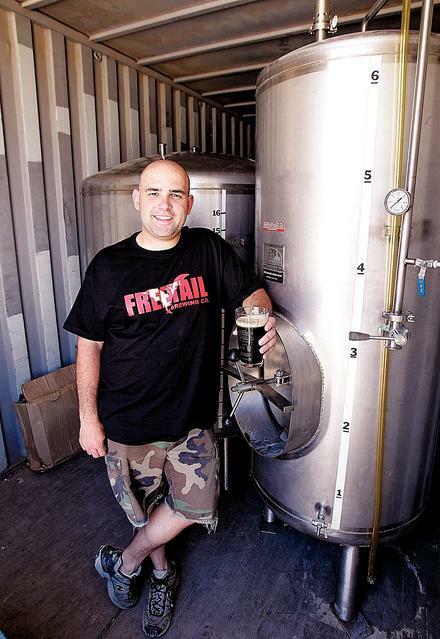 When it became apparent that I really was going to have a micro brewery to play with I sat down with the boys and we decided what type of beer to brew. We settled on a golden ale and I put together a few home brew recipes which eventually became Ór. I hope to brew a few other recipes as seasonals in the future and also put together some unique recipes too. If you did home brew, do you still? I haven't brewed at home since Trouble started, partly because I haven't got the time but also because I cannibalised some of home brew kit to use in the brewery. You'd be surprised how much home brew kit can be used in a microbrewery. In fact, despite its 12 hectolitres capacity, I see our brewery as a giant home brew set up. We only brew one beer at the moment; our golden ale Ór, so I suppose that's my favourite! It has a full combination of English and American hops along with a healthy measure of Munich malt to pad out the malt profile. We only have a few batches under our belt, so the beer is evolving all the time. Hopefully we'll settle on a recipe that balances well. 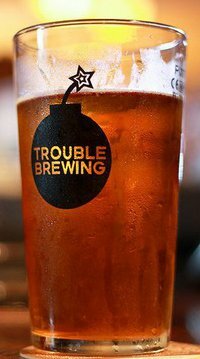 Trouble was the first brewery I worked in and I figured out how to brew with the equipment from first principles. I had years of theory behind me from my brewing studies, along with the hands on home brewing time, but in the end it came down to the three of us standing in front of our equipment as it it lay in a hundred pieces and figuring out how to put it together. There was quite a bit of head scratching but we figured it out. After that it was a similar experience on our first brew day. I knew what had to be done, and between the three of us we had a thousand litres of wort fermenting by the end of the day. It was very challenging and continues to be so. Well, it's got to be Ór again. I greatly enjoy the upfront hop character which is followed by a wonderful lingering malt finish provided by the Maris Otter. I can think of any number of breweries I would like to work with, but Stone in the US stick out as the most interesting. Their beer is completely uncompromising and bursting with flavour. I find their marketing sharp too. I think it would be quite an experience working with them. Fuller's London Porter blows me away whenever I try it. I seem to forget how good it is. I have tried to replicate it many times at home using various amounts of brown, chocolate and crystal malts. I like it so much because it is a porter that isn't a stout. That might sound funny, but I find a great many porters are nothing more than feeble stouts. Fuller's porter doesn't try to do that. It gives a dark beer flavour without any sharp roasted notes. It's mellow with a unique brown malt smokiness. If you are one of the people that regularly reads this blog, you will know that since moving to the US I have been engaged in trying to find an American craft pilsner worthy of the name. Of course, when I say "pilsner" I don't really think of the German version, I have Bohemian pilsners in mind, the kind of beer I drank a lot of in my decade of Czech life. Some of them have been okay, some of them have been awful, the vast majority of them were meh, one had me in raptures of delight - and no surprise really that it was the only one hopped only with Saaz. Then of course there is the one that I had a hand in brewing, and that particular beer, called Trukker Ur-Pils is now available on tap at Devils Backbone. A quick review then, the beer was brewed on August 14th, with an original gravity of 12.5º Plato. When the primary fermentation was a single degree away from reaching the target gravity, they closed the airlock - a German process called spunding. By closing the airlock, the CO2 created thereafter goes into solution and carbonates the beer - I am not entirely sure how close this would be to cask conditioning, because there is no extra priming sugar or similar added. The beer then lagered for 30 days. On Monday the beer was officially tapped at the brewpub, any ideas then where Mrs Velkyal and I had dinner on Monday? In my excitement to get off work and get to Devils Backbone, first seeing to the dog and then driving the 30 miles out there, I forgot to take my camera - but I will be drinking more of the beer this weekend and will take pics then to add to the post. If I were going to the Beer Bloggers Conference in November, I would lead a seminar on how not to blog. Anyway, use you imagination - your imagination will be greatly helped if you have ever had a kvasničák (that's unfiltered krausened lager to the non-Czech speakers). Yes the beer is slightly hazy, seeing as though it is unfiltered and unpasteurised, and came with a good couple of inches of head. A quick side thing here, another of the legion reasons I have for loving Devils Backbone is that every beer they pour comes with a head on it, instead of looking as though inspired by the floating scum that reminds me of cups of tea at my nan's in London. So it looked the part, and by 'eck did it smell the part. With 40IBUs of Saaz goodness, it was lemony, with hints of orange blossom, fresh bread and hay floating about in there for good measure. In chatting with the barman we lamented that so many beer lovers over here seem to think that hoppy equals grapefruit. Then came the moment of truth. Biscuity, slighty grainy, bready. Oh yes! Is was gorgeous, crisp and long in the finish with no trace of diacetyl whatsoever. Being sat at the bar, with a pint of superb pilsner in the hand, I felt at home, I was transported back to Bohemia. So of course I had another, and another, then some food and maybe another couple of pints. Of late, Mrs Velkyal has been a one pint person when we go out, she had two of this, and loved it. So yes, Trukker Ur-Pils would stand up to the ultimate test, if I had been served this in Zlý Časy or Pivovarský klub, I would have had no complaints at all. To my mind it is up there with Kout na Šumavě and Pivovarský dům's Štěpan. I can give no higher praise, and exhort anyone living within striking distance of Devils Backbone to get down there while it lasts, and fill your growlers if you have them (I have two in the fridge waiting for the weekend)! Is it obvious that I am a happy man? Mrs Velkyal seemed to spend an inordinate amount of time on the phone yesterday - thankfully we have Vonage and so pay a set monthly fee and can call locally and nationally, as well as to select foreign countries (including all the places my family live) for no additional charge. Goodness me this is boring stuff. Bland, undertoned and quite simply insipid. If anyone in the Charlottesville area actually likes this stuff, I have 5 more bottles that I am willing to give away for free. If this is the best large brewery in America, then God help us. I have a grudging respect for Michelob. This beer, in common with most of their wares, is nothing special but perfectly drinkable and inoffensive. This reminded me of my spiced winter ale, but a lot weaker and more watery. This was again very sweet, but not cloyingly though sufficiently sweet to be sickly if you drank more than a few ounces. Not what I would have expected from Dogfish Head. The pumpkin ales then that I had yesterday would not inspire me to brew my own, though I wonder if the base beer, which would seem to be a generic amber ale, gets overwhelmed in the process? Would a pumpkin stout work better? Or even a pumpkin Belgian sour red? At the moment then I still have no plans to make a beer with pumpkins, I already have plenty of experiments to do. On a side note, today sees the release of the Pilsner that I helped brew at Devils Backbone. If you are in the area, get along to the pub tonight and try it. You may well run into me filling every growler I have available! This week we head up to Pennsylvania and a brewery with one of the coolest names I can think of - Bavarian Barbarian! I was a professional actor living in Richmond, VA and working for a local hardware store in the fasteners department when a theater colleague of mine had become the head brewer at Legend Brewing Company. He knew I wasn’t very happy working at the hardware store, so he suggested that I apply for a delivery driver position that had just opened up at Legend’s distribution wing. I got the job and delivered beer in Richmond, Williamsburg, Virginia Beach and everywhere in between. After about eight months, a brewer decided to move on to other things, so I moved over into the brewery. Instantly fell in love with brewing. I also really enjoyed working with my fellow brewers there. They were a great group of guys, a few of whom are still there, and I truly looked forward to working with them every day. I continued the acting career for about two years while working there, but I discovered that I enjoyed brewing much more than the acting. So I quit acting altogether and focused more on learning about brewing. I only left Legend Brewing Company because my wife, Kira, got accepted to grad school at Harvard University. Upon moving to Cambridge, MA, I looked for brewery work, but the only thing I landed was a couple of days work at Cambridge Brewing Company with Will Meyer. Lots of brewery jobs in the Boston area, but there were also a lot of brewers who weren’t really going anywhere. So I took a job as a carpenter and a welder for a scenic studio building scenery for corporate trade shows and displays for museums and aquariums. I missed brewing, so I put together an all-grain homebrewing operation after my wife and I moved to the Brighton area of Boston. I brewed beer on the balcony of my second-floor apartment overlooking Commonwealth Avenue while watching the trolley go by and neighbors walking by wondering what the hell I was doing up on my balcony. For me, it’s creativity. I’m a very creative person and I love working with my hands, so brewing is a perfect way for me to get my ya-yas in both ways. I answered the first part of this question in #1. I did it backwards. I began as a professional brewer and then became a homebrewer. The beers that we debuted at Bavarian Barbarian Brewing Company were, in fact, first developed in homebrewing, but they were refined on the ten-barrel system here at the brewery. I don’t homebrew anymore at all. I keep my equipment in case I ever want to do a pilot batch, but I just develop a recipe and take it straight to the brew tower. My favorite beer to brew is the Steel Drivin’ Stout. The aroma of the mash is sweet and roasty. And I love the taste of the pre-hop wort in the kettle. After fermentation, I really enjoy how the beer changes as it ages. At Legend Brewing Company, I always enjoyed brewing the Legend Brown Ale. The aromas coming out of the mash tun from the caramel and dark malts were just sublime. It varies all the time. Right now, I’m digging our 2x4 IPA because it’s a fresh batch and the hop aroma is really awesome. But in two months, I’ll probably be all over the Steel Drivin’ Stout or the Headbangerz Brown Ale. Hammerin’ Ale (our amber ale) is my drink-all-day beer, so if I’m doing some menial, neck-down work in the brewery I’ll drink a few of the Hammerin’ Ales. I’m not really concerned with authenticity at all. Creative interpretation is where it’s at, for me. If fact, I’d prefer to simply think up a beer recipe and choose malt, hops and yeast, brew it and then try to figure out what the hell it is. Well, I’m in the middle of a collaboration with my first choice - Terry Hawbaker at Bullfrog Brewery. He’s been doing some amazing things with barrel-aging and wild yeasts for a couple of years now and he’s definitely the guy to learn those techniques from. Plus, he’s fun to work with. Beyond that, I think I’d like to work out some collaborations with other brewers here in Central Pennsylvania. There’s a great group of breweries and brewers within a sixty-mile radius of Williamsport, where I am, and I’d like the opportunity to work with any one of them. I don’t know if I’d ever wish I’d brewed a beer that someone else had done. As far as I’ll go is wishing I had the capacity, the skill or the creativity to brew the kinds of beers that others are doing. A lot of times I’ll encounter a beer that will inspire me to try something similar. For instance, I was at a beer festival in Philadelphia one year and I sat on a panel of brewery owners for a Q&A session on starting a brewery. Besides myself were Brian Hunt from Moonlight Brewery in California and Paul Philippon from Duck-Rabbit Craft Brewery in North Carolina. Both of them brought amazing black lagers - schwarzbiers - to the festival and they inspired me to brew my own. I haven’t done it yet, but it’s still in the back of my mind. 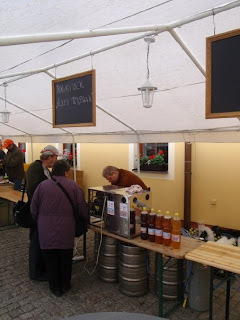 This weekend I will be going to my first beer festival since the wonderful, and pissed up, Slunce ve Skle in 2008 - when I first met Pivní Filosof, Honza Kočka and some random Czech bloke insisting that none of beers at the festival were as good as Pilsner Urquell, even as he was putting them away with the best of them. That was also the night when I went and bought a bottle of beer liqueur which was 28% and tasted like boozy Benedryl - I liked it, as did Pivní Filosof, though I believe he has no recollection of this. Now, unlike the entire twitterverse seemingly, I am not flying up to Denver for the Great American Beer Festival, rather I am driving down the road to the slightly less metropolitan Scottsville for the somewhat more local event, the River Bend Beer Festival. I am perfectly prepared to say that big events like the GABF have their place, it's just not the kind of place you are ever likely to find me, simply because I hate huge crowds. It doesn't matter what the event is, I have some kind of mental cut off point where I don't want to be surrounded by a massive crowd. The same is true with things like open air markets, I like them, but I will deliberately go early in the morning to avoid the crowds (the fact that generally you get the best stuff then is entirely incidental). I also find that I like the ethos of an event such as the River Bend Beer Festival because it is about Virginian craft beer. The event will be showcasing 11 Virginian breweries, including 3 of the local brewers, as well as having live music during both sessions on Friday night and Saturday afternoon. I mentioned in a previous post that the Tops of the Hops event here in Charlottesville was slightly disingenuous in advertising 150 craft beers being available, and then including the likes of Pilsner Urquell and Blue Moon in that list, whereas River Bend are committed to Virginia beer and only Virginia beer - supporting local companies. One of the brewers whose wares I am particularly looking forward to sampling is Shooting Creek Farm Brewery, having heard good things about them from a couple of people. I have also heard good things about Jefferson Street Brewery from Lynchburg, and I need to correct the fact that I have never tried a beer from the St George Brewing company down in Hampton. I will be at the festival on Friday night, when they have their Connoisseur tasting session, partly in a business mode because the company I work for are sponsoring the event, and we also re-designed the festival website. So for my local readers, if you are going on Friday night, pop over to the Category 4 table and say hello, but most of all come down and support Virginia's craft brewers. By the way, both pictures were taken at Slunce ve Skle, it was bloody freezing that day, but bloody fantastic as well, which is also this weekend and I believe there is something starting in Munich this weekend as well. includes some strange ingredient or method which is this month's "innovation"
It is almost as though the very term "session beer" is the tippler's equivalent of "meh". Now, I am perfectly prepared to accept that my hermeneutics of other people's texts and utterings is wrong, a touch too much of Ricoeur's hermenteutics of suspicion? The notion then that a low alcohol beer could possibly be interesting is alien to many a ticker and tippler mind it would seem, especially on this side of the, rather turbulent of late, Pond. Evidently such people have never been to Devils Backbone. Yes, I wrote a few posts about DB a few weeks back, but yesterday afternoon Mrs Velkyal and I drove that way for some afternoon refreshment and as it was a cheat day on our healthier living efforts, have a burger and chips. Mrs V wasn't in a booze mood, perhaps still recovering from rowing 13 miles round an island on Saturday, and I took one look at the menu and knew I wanted Ale of Fergus. Unfortunately I didn't have my camera with me, so please use your imagination. What arrived at our table was a deep crimson beer, topped with a light tan head, which was at least an inch thick. What left the table about 7 minutes later was an empty glass, with plenty of lacing and a request to our waitress to haste ye back with more! Good? Bloody hell it was marvelous! I am sure I could wax lyrical about toffee and cocoa notes and the merest hint of spicy hops, but why, when it was the sheer pleasure the beer bought me which is the abiding memory? I have mentioned at least once before that I love those times when a beer hits the spot so perfectly that it takes you back, like Anton Ego in Ratatouille, to childhood. That's how this beer was when I shoved my face into it to get a good sniff - straight back to the Sergeants' Mess bar and the smell of beer and tobacco. I think the second pint was polished off with just as much aplomb as the first. Then the third, then the fourth and one final one before driving the long way home, just to see it was any different from driving the equally long way home. As I said to the barman yesterday, there is only thing which would have improved the beer for me yesterday - being served on cask. Given though that all Devils Backbone beers are naturally carbonated using the spunding method, I wonder how much difference it would actually make. Oh, and I forgot to mention the abv on this treasure. 4%. Yes you are reading that correctly, 4%. Bursting with flavour, easy and smooth to drink and only 4%. Hurray for session beer, hurray for Devils Backbone! This week we head back across the Atlantic to Northern Ireland, and to a brewery which has recently featured on The Beer Nut. The blame has to sit fairly and squarely with the Appollo Bryggerie, Copenhagen. I was travelling quite a bit to Denmark with my job and this was a favourite place especially at Christmas, with their selection of ales. It was my inspiration! I think you have to be a little bit mad!!! But no seriously, I think you have to be tenacious and inventive in how you go about your work and how you differentiate the beers you brew from the variety in the market place. I had brewed on and off for a few years – I’ve converted one recipe to full scale production…with a little tweaking and a little magic along the way. No as much as I would like to I’m too busy with brewing and bottling as well as still working full time in my ‘day job’. It has to be my new beer – McGrath’s Irish Red. The aromas of the mashed malts and boiled wort are very rich and almost opulent in terms of the sweet toffee and heavy caramel. No I’ve never worked in another brewery. I think the flavor profile from the hops and malt has to be consistent over and over. If you use good quality hops and malt then consistency in terms of ingredients can be achieved. However this has to be balanced by consistency in the brewing methods used. Temperature control and good hygiene is a must to ensure that the product is as consistent as you can possibly make it. If both these are achieved then you can stand over your beer as an authentic product, that is consistent from gyle to gyle. Plus it helps when you throw in that little bit of magic that makes your beer unique. 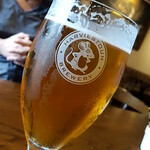 I’d love to work with the guys at Harviestoun, I’d love to know the secrets behind Old Engine Oil……..
Harviestoun’s Old Engine Oil – I think it’s a fantastic beer, very smooth and tastes great either cold or at room temperature. Last night I went to my first CAMRA meeting. No, not the Campaign for Real Ale. Charlottesville's local homebrew club is called the Charlottesville Area Masters of Real Ale, or CAMRA. Yes, yes, I know I have been here now for over a year, but I had not plucked up the courage to go to a meeting quite simply because these guys win medals left, right and centre at homebrew competitions. Anyway, one of the members recently started following my Twitter feed and we got into the conversation that seems to be de rigeur in American beer circles at the moment, Black IPA or whatever the trendy term this week is. It turned out that Jamey had brewed a Black IPA around the same time as I brewed my Red Coat India Black Ale. We agreed to meet at CAMRA's monthly meeting and compare beers, a short version of the comparison would be; both were good. Jamey used American C-hops and for the first time in a Black IPA they didn't taste out of place, although my first thought of the nose was sweaty jockstraps, but that became blood grapefruits after a further sniff or two. On the basis of his beer I wonder if part of my gripe is with the lack of balance in the IBAs I have had so far? My beer was also good, judging from the approving nods and comments from various members, but given that the hops were British, the consensus was that this was really a porter. I suppose that reaction very much vindicates my belief that Black IPA is actually just an over-hopped porter, using American hops rather than British. Given that the IBU range for Robust Porter according to the BJCP (sorry to the non-style people) is 25 - 50, and that according to a recent post on Ron's blog, 19th century porters shipped to India had about a third extra hops chucked in, then the evidence is stacking, in my mind, that India Black Ale belongs with the porters rather than the IPAs. As such, I have decided to enter Red Coat in the upcoming Virginia Beer Blitz as a Robust Porter rather than my initial plan to enter it as a Category 23 Specialty Beer.Also being entered in the competition will be Machair Mild, as Experimental Dark Matter has been renamed, and Gunnersbury Gold, a Best Bitter. Today is Labor Day, or Labour Day if you live in Canada. Essentially it is America's equivalent of International Workers Day, usually observed on the 1st of May. As one of the few days off throughout the year here, I plan to take advantage of it entirely, by doing as little as possible, other than taking the dog for a long walk at 6 in the morning and generally tidying the flat. As such, here are some pictures of beer related stuff, starting with the pipework underneath Devils Backbone's brewhouse.. I was a homebrewer and huge beer geek that wanted to wake up every day and look forward to going to work doing something I believe in. In New Year’s Eve 2005 I promised myself to open my own brewery. We opened in November 2008 and to this date it’s the only New Year’s Resolution I’ve ever kept. I’m an economist by trade and training. I don’t think this is a fair question because, like the economist, the brewer is part scientist, part artist. There are successful brewers who make incredible beers by leaning towards one of those characteristics over the other (in his homebrews, our assistant brewer John refuses to take any readings or document anything – a habit he thankfully doesn’t carry over to the brewery). Who’s to say which is most important? Because it’s a rule at our brewery, I’ll just say that the most important characteristic of a brewer is that he have a beard. I was a homebrewer for 5 years before the brewery opened. Exactly zero recipes have I ever even considered to convert to full scale production. I made mostly clones of my favorite brews, but on a professional level I didn’t want to be a clone of anyone. I have a wonderful brewing team that is really creative and when we sit down and bounce around ideas for a new beer it really pushes me creatively. I also leave the door open for us to brew anything – I’m open to any and all ideas. The only things I’ve vetoed are two styles I don’t particularly care for. My motto is I’m not going to brew and sell something I do like myself. Sadly, since the brewery opened I haven’t homebrewed. It’s not for lack of wanting, but lack of time. I love the primal nature that only homebrewing can really offer – working as closely as possible with every aspect of creating the beer. Even for a small brewery like us, some of that gets lost. This is always the toughest question to answer, it’s like picking which of your children is your favorite. For obvious reasons, I drink our sessionable beers the most. Usually if I’m sticking around for a few hours I’ll drink a few different of our lower ABV beers. The beers I’m technically most proud of are our Rye Wit (witbier), Torpor Porter, a robust porter, and Broken Promise Pale Ale (an English pale ale). I think all are world class examples of their style. If I’m sharing with friends, I go to our big beers. Our imperial stout, La Muerta, is unique in that is uses rauch malt, and it’s a beautiful beer. I think most important is that the brewer is authentic to what he is trying to accomplish. When we make our Spirulina Wit (a naturally green beer) we certainly aren’t being authentic in the traditional sense. We are making a glowing, green beer after all. But we are authentic to our goal, which is to make something people enjoy drinking while pushing their notions of what beer can be. I’d probably pick one of the breweries in my state who I’m friends with. While it would be really cool to collaborate with new people on the other side of the world, there is nothing better than doing something cool with your close friends. I wish I would have invented the first tasteless, mass produced lager so that I could have immediately poured it down the drain before anyone else got their hands on it, saving us from the years of mediocre beer we suffered through in the US after prohibition. I am fairly sure I have mentioned this before, possibly more than once, but I am an Army Brat. My father was in the British Army, as were my great uncle, my Old Contemptible great grandfather, my brother and assorted ancestors. We lived in Germany as well as various parts of the UK. Wherever we were living though, there was always a regimental open day, when you could sit in the tanks, helicopters and get a close up long at other bits of kit. In the summer, my little brother and I would spend a lot of time going to work with Dad. Every Remembrance Day we would remember those that died in various wars. When we lived in Arborfield we would go to the Aldershot Show. We would watch the Royal Tournament and Edinburgh Military Tattoo on the tele. What has this all to do with beer? They say that an army marches on its stomach, and that stomach traditionally received a daily ration of ale, and they would buy beer from the local taverns wherever they were campaigning. It was during the War of the Austrian Succession that the British Army adopted the Dutch practice of "Doe den tap toe", which literally translates as "turn the tap to", or stop pouring the beer. Apparently the British Army made the tattoo, as it became known, into a signal played by the Pipes and Drums to the local publicans to get them to stop serving, and for the soldiers to get back to barracks at a decent hour. The tattoo was, in effect, the call for last orders. Today though, a tattoo is a all about military bands and display teams, like the White Helmets, the King's Troop of the Royal Horse Artillery and the Massed Bands, such as the Pipes and Drums in the video below.